“This time is gonna be different.” That’s what I found myself saying for the fourth time in as many years as I walked to the Wilde Lake High School auditorium, or as we “peons” like to call it, “The Devil’s Lair”. And speak of the devil, there she was, striding down the hallway with her usual air of superiority. To the rest of the school, she was known as “Ms. Weaver”, “Weaver”, or “The Weave”. To us, the Stage Crew Faithful, she was known as “Satan”, “Toadstool”, or if we were feeling particularly creative, “Lord Bigmouth, the Smelly and Terrible”. If Stage Crew had its way, that would have happened a long time ago, believe me. For far too long, Stage Crew had been unappreciated, belittled, and slandered under her reign of terror. There was the time freshman year when she made my sweet friend cry because an actor forgot his line (apparently it was because the bright lights on the stage affected his memory). There was the time sophomore year that she made ten people sweep the stage because “stage crew takes too many breaks.” Plus there’s the fact that she had never once acknowledged our existence while singing the praises of the drama department as a whole. Unfortunately for us, she was beloved by the actors and parents of the Wilde Lake Drama Program alike. Everything was going fine until intermission. The actors were remembering their lines, tech and sound were hitting their cues right on time, and most important of all, Satan had not once even looked back at the booth. Ignoring us was many times better than the alternative. I pressed the talk button on my headset and said, “I can’t believe this is actually the year where we don’t get completely destroyed during dress rehearsal.” Of course, I spoke too soon. A few minutes into the second act, just as the lights were supposed to come up for the big romantic number, the lights control panel shut down by itself. As the music started playing, I furiously rebooted it and prayed that it would reboot quickly and quietly. It didn’t. Oh no, oh no, oh no, I thought to myself. The rehearsal was going so well. After that we were on a fast descent into hell. One of the leads forgot a line, Satan blamed it on a prop malfunction. Another actor missed his entrance, Satan blamed it on a nonexistent sound cue. By the end of the rehearsal, I was nearly in tears and felt mad enough to behead someone with an electric chop saw. This has been happening for three long years, I thought. I was not about to let it continue for a fourth, and so in my mind I began formulating what would become known as Operation CTF- Catwalk Trust Fall. As soon as the run was over, Stage Crew met after that disastrous final dress rehearsal to comfort one another and commiserate. “Well, we can’t say that it was unexpected,” Grace, a stagehand said. “We’ll just have to suffer through it, just like we do every year,” Josiah, a sophomore sound technician groaned. “You know what this makes me want to do? Take a nice trust fall off the catwalk,” my friend Rebecca said, using the old vaguely suicidal yet somehow hilarious refrain that had been around for years. A slow clap rose from the back of the loose clump. “Wow, that’s inspiring. I can almost hear the Lord of the Rings soundtrack playing in the background. But seriously, it’s not exactly a new problem. Weaver has been horrible to us for years, and no one has ever done anything before. Is it even worth it?” Jamie the stage manager asked, finally throwing his two cents into the ring. “No!” The Stage Crew spoke as one. One by one, all of the stagehands, techies, and fly crew gave their support. By five o’clock the following day, Operation Catwalk Trust Fall was ready to go. All the Stage Crew members had been alerted of the plan and sworn to secrecy. The power tools and lumber had been stockpiled in the booth. We also had a one-hundred pack of water bottles, several first-aid kits, duct tape, and enough candy to last us through the night if need be. Now all there was left to do was to act natural and wait. At roughly six o’clock, an hour before the show was set to begin, Stage Crew met for our pre-show meeting. Timmy, a freshman stagehand raised his hand. “Okay, let’s go! Hands in the middle! Stage crew on three! One… two… three, stage crew!” He looked around in confusion, and everyone burst out laughing. We walked through the auditorium and up the stairwell to the booth and spotlight bays. In our all-black attire, we must have looked like a funeral procession. Our mood, however, was one of determination and our faces were defined by grim smiles rather than frowns and tears. 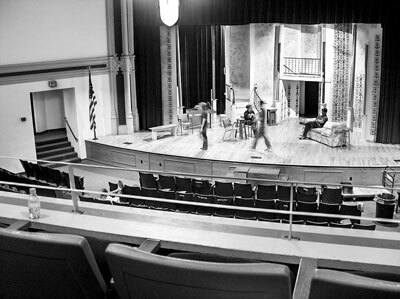 Someone first noticed that stage crew was missing at 6:15, fifteen minutes before the house opened for the audience. It started with a member of the ensemble. “Hey, where’s stage crew?” he asked. Whispers quickly spread throughout the cast. “They’re so lazy; where are they?” Ashley Smith, the quintessential high school actress, complained. “They’re probably out smoking, like a bunch of losers,” another cast member joked. That was too much for me. I grabbed a role of gaffe tape, carefully opened the window of the booth, and chucked it directly at the group of cast members congregated on the stage. It hit Ashley square in the back. The effect was instantaneous. They screamed dramatically like the theater kids that they were. Then they tried to find where the deadly projectile had come from. Eventually, their gaze landed on the booth. Amid the shouts from the cast members, I closed the window of the booth. They didn’t even deserve an answer. Through the thick pane of glass separating stage crew from the cast, I could just make out what was said next. “Fine, if they won’t come down, then we’ll go get them down ourselves. They can’t do this! We have a show to perform!” exclaimed Joe Ramsay, the pretentious senior who always got the lead. The cast started moving as a mob, down of the stage, through the audience seats, and towards the booth staircase. I turned to Jamie, who was acting as my second-in-command. As the cast members rushed out of the staircase and desperately tried to gain access to the booth, we opened the doors and met them with five 8-foot long planks of wood. Each time an actor got within range, they got thrust backward. This continued for five minutes, with the volume and fervor of the cast rising with each attempt. Suddenly, a loud and nasally voice cut through the pandemonium. “Excuse me, what’s going on here?! What is the meaning of this? !” It was Satan herself. I didn’t respond, and neither did anyone else. “Do you find this amusing or something? You have injured one of my most talented actresses!” Just a bit farther. Weaver took one last step forward, and sealed her fate. The five people manning the two by fours pushed forward with all their might, and the the Weave toppled backwards, screaming in pain and disbelief. All around me, cheers and jeers erupted from the booth. With that, Satan turned around and limped down the staircase, followed by the battered and bruised cast. We had won, for the time being. However, I knew that the Weave meant business, and the principal would surely side with her. I was fine with getting in major trouble, but I knew I couldn’t expect the rest of Stage Crew to share those feelings. This proclamation was met with overwhelming and pre-pubescent sounds of support from the underclassmen. Down below, I could see Weaver reentering the auditorium, bringing the principal with her. It was time to make a decision. We could have been suspended. We could have been expelled from the theater department. Stage crew could have gotten more recognition. Weaver could have left Wilde Lake forever. In that moment, it didn’t matter to us. In that moment, as we faced the wrath of Satan and the tyranny of the system together, all we knew was that we weren’t going to give up and that the show would not go on that night. This time was different after all. We, the Stage Crew, stood defiant. My own experiences in high school Stage Crew as well as other comedic stories about theater from my younger childhood inspired me to write this piece.